Objectivity is necessary for conservation; it is a scientific, technical, and calculated field. However, the necessity for objectivity is two-fold as sometimes a conservator must take refuge in objectivity to circumvent becoming immersed in the subject of a work. This was very much the case during the nearly year-long treatment for Mauricio Lasansky's, The Nazi Drawings. #27, Mauricio Lasansky, Watercolor, Graphite, and Printed Paper on Paper Collage. "It's a collection of 33 drawings executed with graphite and oil wash on heavy calendared paper. In addition to the sensitivity of the graphite surface, the oil washes have become fugitive to abrasion with age. Great care and preparation had to be maintained throughout the handling and the treatment of each sheet. Some of the drawings have collage elements, some of the drawings exhibit distortion. All of the drawings were hinged to a secondary sheet. The secondary sheet was acidic," says Senior Paper Conservator, Brian Kapernekas. Due to the significance of the collection and the complexity of the treatment, two pieces from The Nazi Drawings will be featured in The Center's EXPO CHICAGO booth this year (booth 143). 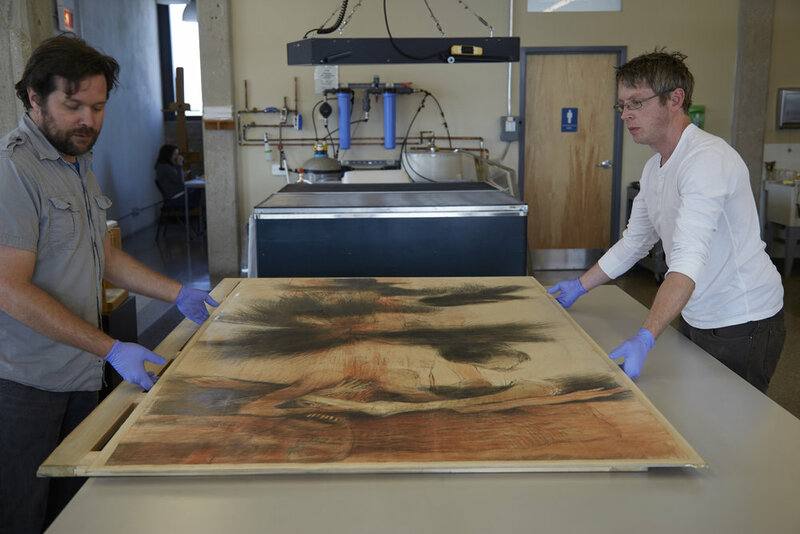 When #19 was submitted for examination, our conservators focused on stabilizing the piece for future display. Minimal distortion was present on the sheet. It was selectively hinged and pasted along the top to a secondary acidic sheet which was mounted to a tertiary acidic paper board, and was housed with non-UV filtering glazing. The frame showed general age and handling evidence throughout. Number 19 being removed from its frame. The frame exhibited corrosion accretions which were mechanically removed. The frame was then solvent cleaned with the appropriate conservation materials. The sheet was surface cleaned and hinged onto a new archival mount using conservation grade materials. The finished product seen here reflects hours of conservation that will continue to keep this piece safe and stable for future years of display. #19 being removed from its mount by our conservation team. #33 Triptych is one of three that depicts imagery of the Nazi destruction. While the left panel is solely displayed, our paper conservators are currently working on the right and center panels of the triptych back at The Conservation Center’s laboratory. For this panel, it was important to address the secondary support and the condition of the framing package. The frame was cleaned and a layer of microcrystalline wax was added for protection. The original housing was replaced with conservation grade materials to protect and properly house this massive work on paper. While conservators must remain objective, The Center values the importance of difficult collections' complexities and we appreciate our role as a steward of Mauricio Lasansky's powerful work. Fox, Marglit. “Mauricio Lasansky, Master Printmaker, Dies at 97.” The New York Times, April 7, 2012. Accessed September 15, 2016. Mauricio Lasansky, Master Printmaker, Dies at 97.